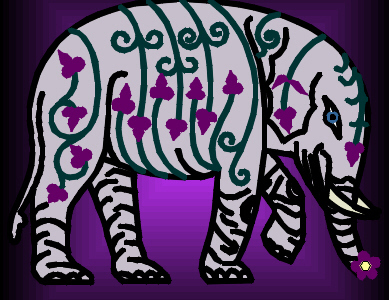 The Nature of the Elephant is his Faith in himself and his notable Memory. His memory is so remarkable that he sometimes remembers stuff that never existed. Still and all, as you can see, he is a beautiful critter, charming, dashing, and charismatic... and massive! The Nature of the Katydid is Hope. And Hope springs eternal from her foolish bosom... Hope that whom she loves will be happy, Hope that those she cares for will be faithful, Hope that "all's well that ends well..." and that Happy Endings truly happen. The Nature of the Bear is his fierce Protectiveness of those he Loves. Bear has been accused of Loving not wisely, but too well. Or is it... let's see... of Loving most wisely, and very well indeed? In any event, Bear is a very Loving creature, and thrives on it whether he gives it or receives it. The Fable which follows tells us that Loyalty is simply ultimate Faith in ourselves and others, unalterable Hope and belief in dreams, and sweetest Love of not just those we honor and respect, but of those who need Love the most. Loyalty is already an immutable part of our Natures.